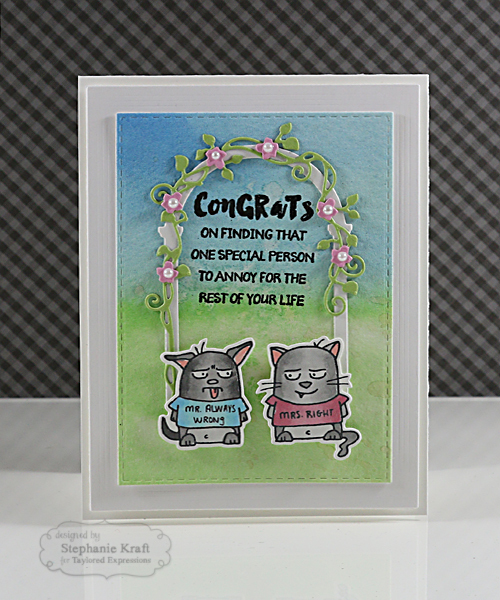 HandKrafted by Stephanie: TE March Sneak Peeks: Wedding Wishes! TE March Sneak Peeks: Wedding Wishes! 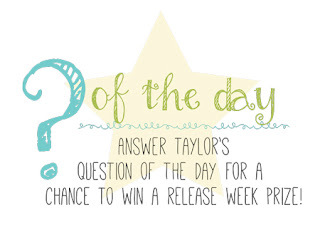 Hello and welcome to the first day of Taylored Expressions March Sneak Peeks! The Creative Team is kicking off 4 days of projects (3 days of peeks and release day). All products will be released on Thursday, March 3 @ 7 AM PST. I used the previously release Happily Ever After stamp set. This month, we are releasing coordinating Happily Ever After dies! It had been awhile since I used this set, and I had forgotten how much I love it! To begin with, I used some new Color Burst colors to create the background that I used for my die cut leaves. I used a combination of Chartreuse and Lime Green. 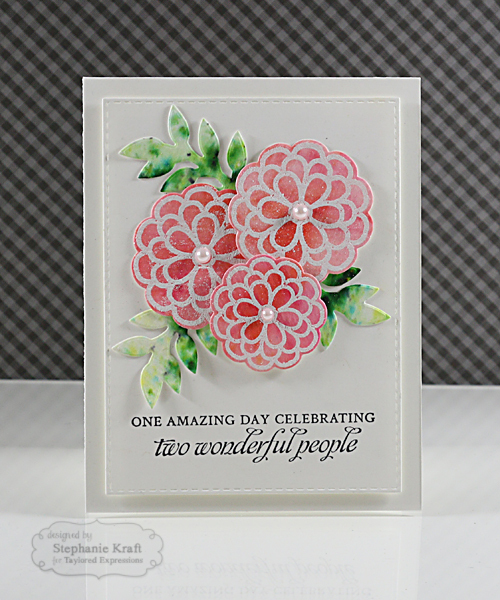 The flower background was created with Fuchsia and Tangerine. 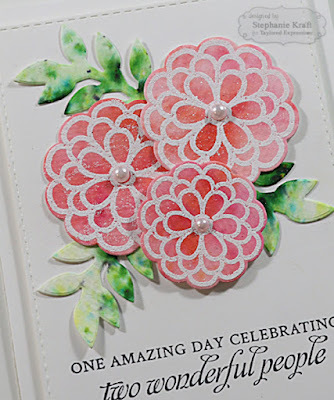 Once dry, I embossed the flowers with white embossing powder, then used the new dies. Finally, I added a snow white pearl in the center of each flower. 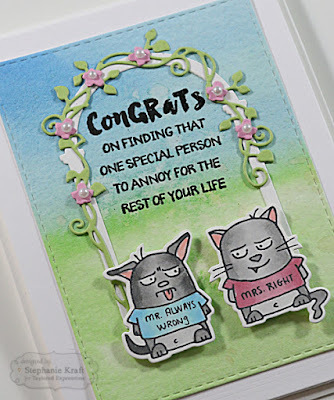 My next card features Mr. & Mrs. Grumplings! These crack me up! I stamped and colored them with Copic markers. After die cutting them with the Mr. & Mrs. Grumplings dies, I added some sparkle to Mrs. Right's pink shirt with a clear Wink of Stella brush pen. It's pretty much impossible to see in the photograph, though. The background is a watercolor wash that I created. Around the happy couple I added an arbor (from Garden Arbor & Gate) and decorated it with Arbor Accessories. The sentiment was heat embossed with black embossing powder. Note: Products in BOLD will be available in the TE store on Thursday, 3/3/16 @ 7 AM PST!